Wayfinding is an important component of a successful destination. It moves people through an environment and into desired locations within it using signage and other visual cues. Wayfinding guides people to places they seek but it also brings awareness to places they may have otherwise missed. It can guide people away from areas you don’t want them to see. Wayfinding helps people find parking areas sooner. The less time spent in cars means more time “spent” in your stores. When visitors see well maintained wayfinding signs, they are reassured that they are on the right path and that they are in a safe area. Wayfinding connects people to places. Branded wayfinding not only guides people to and through places, it serves as a highly visible brand delivery mechanism. A consistent, thematic wayfinding system will knit parts of a community together, support the brand, and tie marketing communications with the place experience. Branded wayfinding helps transform a designation into a destination. It connects people to experiences. Just as some people make the mistake of confusing a logo with a brand, others confuse the design of a wayfinding system as effectively communicating their community brand. A brand is much more than a design, and branded city wayfinding is much more than a bunch of signs with a logo slapped on. A branded wayfinding system should be inspired by, and integral to, the city’s brand strategy. There is a symbiotic relationship between a city’s brand and its wayfinding system. By incorporating a brand into a city, wayfinding ties the brand to the physical environment, creates an emotional attachment for people through familiarity and reassurances – as well as new experiences and encounters. Branded wayfinding can provide added benefits and purpose to an otherwise generic signage or wayfinding system. In addition to its basic functionality in providing orientation and navigation, a branded system introduces personality, storytelling, and most importantly arouses the senses and stimulates emotions through its connection to the core values of the brand. This can contribute to a deeper relationship between the place and its key audiences. In order for a wayfinding system to support a city’s brand effectively and provide outstanding experiences at critical touch points, the city brand should be fully developed and ready for implementation before the first visual concept for wayfinding is explored. A branded city wayfinding system draws inspiration from the brand assets – logo, color palette, graphic character fonts, emotional benefits, and personality outlined in the city’s brand manual or style guide. A branded wayfinding system should never be regarded as an expense for a community who understands that the long term benefits are substantial. If designed right, it will prove to be a smart investment which will transform the community’s trajectory and bring a measurable economic return. Branded wayfinding systems vary in size and complexity. 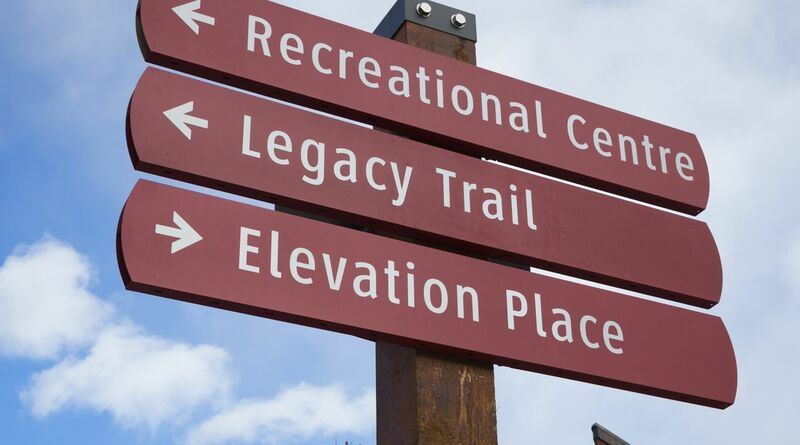 Depending on a community’s density and geographical size, a branded wayfinding system can be as simple as a few guide signs on Main Street or as complicated as a comprehensive program with landscaped gateways, district demarcations, several levels of vehicular and pedestrian guide signs, kiosks, directory maps, interpretive signs and trailblazers. Each unique program will incorporate a combination of elements that are customized to perform within a specific environment. Step 1: Establish a wayfinding steering committee. This committee will include a core group of vested individuals who represent the city, business community and residents. They will evaluate and justify the need for a branded wayfinding program and research/secure funding. One person should be a dedicated point of contact and chair. Your chair will serve as a communication conduit between the committee, stakeholders, the public and contracted vendors. Step 2: Hire a qualified wayfinding designer. Issue an RFQ ahead of an RFP. This will allow you to pre-qualify respondents and weed out the “wannabes.” Qualified designers must have experience in developing successful community wayfinding programs, understand the principals of fabrication and branding, and have worked with and understand USDOT guidelines. Step 3: The contracted designer assesses the project area on site, interviews key stakeholders and submits an assessment report. The assessment report should include, at a minimum, a summary of the objectives, notes from the stakeholder interviews, identify problems and attributes of the existing wayfinding conditions, general observations, documentation of traffic flow, key arrival points, districts and regions, USDOT jurisdictions and potential destinations. Step 4: Loose concepts are generated and a wayfinding plan starts to take shape. The designer should host a charrette with your committee while concepts are in their early schematic phase. This will allow the designer to arrive at three to four presentable concepts more efficiently. Shortly after the charrette, a public workshop may be worth having to start facilitating community buy-in. Step 5: A single chosen concept is developed and the wayfinding plan is refined. During this step, the designer should get estimated probable costs from one or more fabricators. These costs will help you establish a fabrication budget or allow the designer to evaluate the design and meet your budget expectations. We also suggest that mock-ups be made and evaluated in the environment. A picture may be worth a thousand words, but a mock-up will speak volumes! Step 6: The finalized design and wayfinding plan is translated into bid documentation which includes design intent drawings (scaled elevations and details), a message schedule (content on each sign) and a location plan (locations of every sign in the system on topographical maps). Step 7: Implementation begins with the preparation an RFQ and/or an RFP. The designer will supply you with technical specifications and scope requirements to be included in the RFP. They will help you with qualification requirements to be included in an RFQ, should you elect to issue one prior to the RFP. The designer will help with production oversight by interacting with the contracted fabricator. They will review their shop drawings and sample submittals. They will eventually review the installed program to make sure the contract has been fulfilled to its specifications. Todd Mayfield is a Principal and Group Creative Director for Axia. He has over 33 years of wayfinding, brand development, advertising and graphic design experience. Todd has earned numerous awards for design excellence and is also an accomplished fine artist and published author. He lives in Wellington, Florida with his wife and daughter.